Split shutters are correctly termed tier on tier shutters or double hung shutters. Basically they are two tiers of shutter panels, hung in line, one above the other. 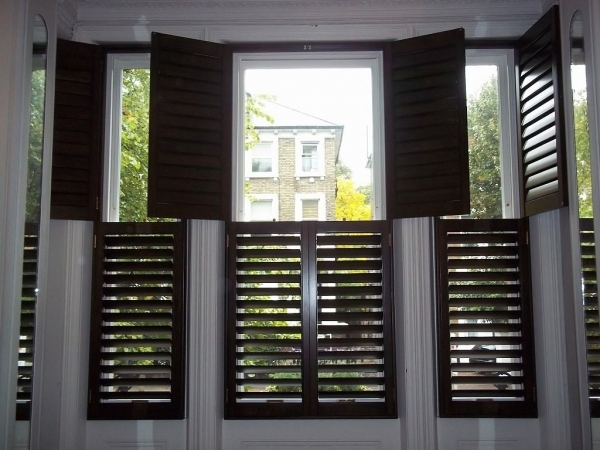 One of the main features of split shutters is that you can leave the bottom level of shutters closed whilst the top level is open, this can allow our customers to let in a lot of light into their rooms, and also means that when they are closed, the slats on the top tier can also open independently of the bottom tier slats. Shutterly Fabulous customers choosing split shutters, are generally concerned about privacy but wish to maintain maximum light entering into the room. Street level bay windows in homes which are situated directly on busy streets with lots of foot traffic tend to opt for this functional design. Split Shutters are not only practical with regards to privacy, and keeping prying eyes away from the interior of your homes, but they also look stylish and definitely let our customers make the most of their windows giving them light airy rooms.